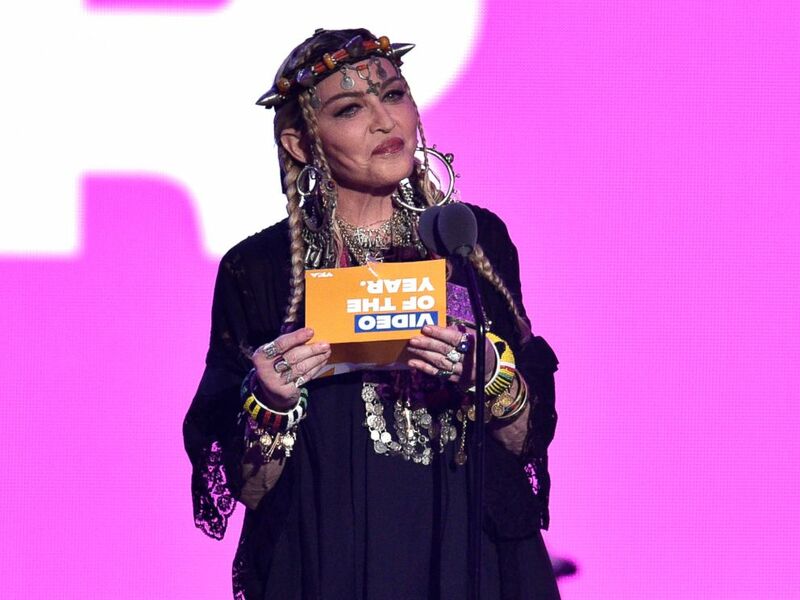 Madonna Tuesday weighed in on the controversial speech she made about Aretha Franklin at the MTV Video Music Awards, explaining that critics misinterpreted what she was trying to do. She took the Radio City Music Hall stage during the second half of the Monday show for what appeared to be the night’s big tribute to Franklin, but her speech appeared to be more about Madonna than the soul singer, who died late last week. "I shared a part of my journey and thanked Aretha for inspiring me along the way,” she wrote. “I did not intend to do a tribute to her! That would be impossible in 2 minutes with all the noise and tinsel of an award show. I could never do her justice in this context or environment. “Unfortunately most people have short attention spans, and are so quick to judge. I love Aretha! R.E.S.P.E.C.T." 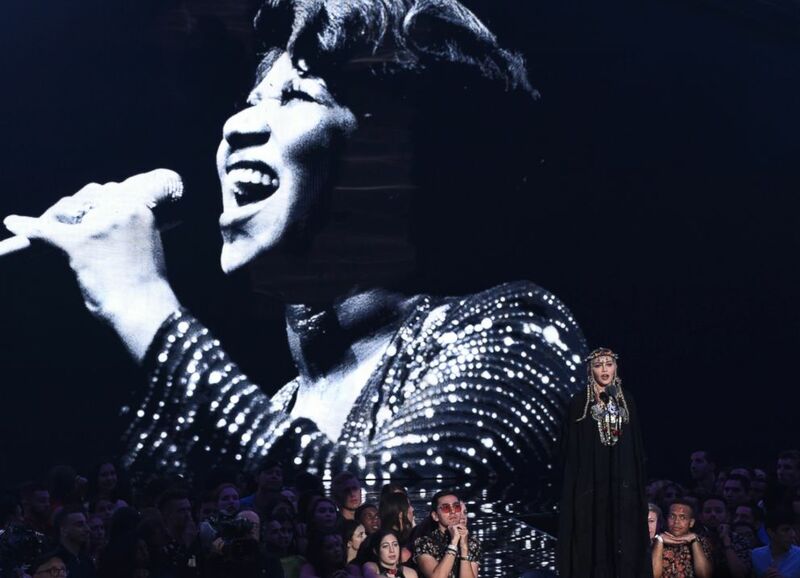 Madonna presents a tribute to Aretha Franklin, pictured on screen, at the MTV Video Music Awards at Radio City Music Hall on Monday, Aug. 20, 2018, in New York. During the awards show, Madonna spoke against a backdrop of a large black and white image of a young Franklin and noted that the late singer "changed the course of my life." The pop star -- donning shoulder-length braids, a thorn-like headpiece and a long flowing black poncho -- went on to tell a story about a time when she performed an impromptu version of Franklin’s "(You Make Me Feel Like) A Natural Woman" at an audition, which was one of the few mentions of Franklin. Madonna said “Aretha” four times during the seven-minute speech but uttered the words “I” and “me” more than 50 times. She also managed to squeeze in a quick reference to her legendary performance of “Like a Virgin” at the 1984 VMAs, where she rolled around on the stage in a white wedding dress and bared her backside. Madonna presents the award for video of the year at the MTV Video Music Awards at Radio City Music Hall on Monday, Aug. 20, 2018, in New York. “After the show, my manager said my career was over,” she said with a sinister smirk. “Well. Hello, sir. I would now like to present the nominees for the Video of the Year." The tribute didn’t sit well with many of Franklin’s fans, some of whom took to social media to call her out. “No to this Aretha tribute. How Madonna making this about her,” one Twitter user said. “You do not disrespect an ICON like that. This is a jovial kiki about Madonna’s broken a-- journey. You honor a legend by telling their story or SHUT UP. The AUDACITY,” another fan noted. Some Franklin fans took to Madonna’s own Twitter page to protest the tribute. Madonna’s VMAs posts, including one that mentioned the hashtags “respect” and “arethafranklin,” racked up hundreds of comments after the awards show. “Love you Madonna, but what was supposed to be a tribute to the “Queen of Soul”, you made it all about you. You and @MTV should be ashamed. Very disappointing,” one user wrote. “Wha....what is going on here?!?? Who approved this,” another said. “I love you ty for amazing us with your beautiful and powerful speech you’re amazing,” another fan added.